The Summer 2013 issue of Spacing is jammed packed with a slew of great articles, photos, and interviews focused on Toronto urbanism. This article appears in the issue in our Features section. For more unique articles focused on the public realm of Toronto and Canadian cities pick up a copy today. Find your copy in these stores. We take playgrounds for granted. Like parks, schools, and libraries, they are a natural part of city life, a place where kids can burn off that seemingly unlimited supply of energy. 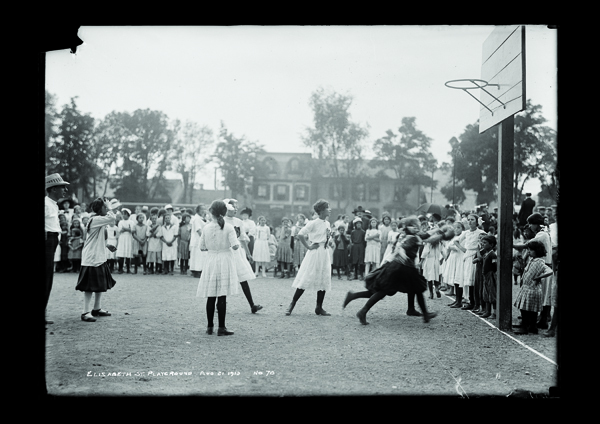 But Toronto’s playgrounds were actually invented at the turn of the 20th century, a result of a passionate struggle over the rights of children and the use of the city’s public spaces. Toronto’s first playgrounds were created in a desperate effort to help children who were growing up in squalid, poverty-stricken downtown slums. With no playgrounds or parks nearby, slum children had no choice but to play in refuse-strewn alleyways or on the streets. Many youngsters were injured or killed in collisions with horse-drawn carts, streetcars, bicycles, and the first cars. Hundreds of children on the streets earned money by begging, selling newspapers, shining shoes, running errands, or delivering messages. Girls often had infants and toddlers — their younger siblings — in tow. Some children slept on the streets, unwilling to return home, or without a home to go to. To read more of this article by Erica Simmons, pick up the latest issue of Spacing or subscribe. Children were able to use the streets as playgrounds before the coming of the automobiles. Once the automobiles came, they pushed the kids off the streets into empty lots and eventually playgrounds in parks. For several decades, until recently, everyone was forbidden in the City of Toronto to play anything, go to entertainment, or do sports on Sundays. Swings were padlocked, slides were chained, and tobogganing was a no-no on Sundays. People had to go outside the borders of Toronto to have fun.